This blog relates more to an ESRC project on climate change than to the Leverhulme project on climate change and scepticism, but I think there is a tangential link. 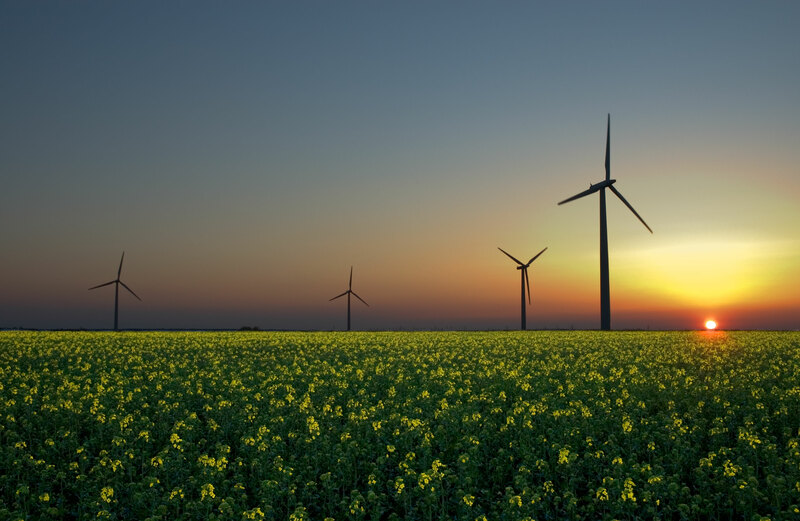 As part of the ESRC project, we are interested in finding patterns in climate change communication and policy over time and across countries. In that context I wanted to examine patterns of discourse (and in the first instance ‘simple’ word usage), related to three major strategies discussed in the context of the management of climate change: climate change mitigation, climate change adaptation and geoengineering. My hypothesis was that mitigation has been discussed for the longest time but may have gradually been superseded by discourses of adaptation, and more recently proposals to use geoengineering as a solution of last resort. So I set out to see what patterns were out there and whether they would confirm my hypothesis or not. And the more I looked the more confused I became. First I looked at Google Trends and got the following results (on 1 June, 2013) (blue represents climate change adaptation, red climate change mitigation and yellow geoengineering). The first surprise was that the highest volume in interest was in climate change adaptation and that this interest emerged before interest in climate change mitigation. The pattern for geoengineering conforms more to my own impressions, with a first real peak shortly after the publication of the Royal Society report, followed by other peaks probably related to the SPICE project etc. I then turned to Google Ngram viewer (also 1 June, 2013) which charts the volume of words or phrases used in google books over time. 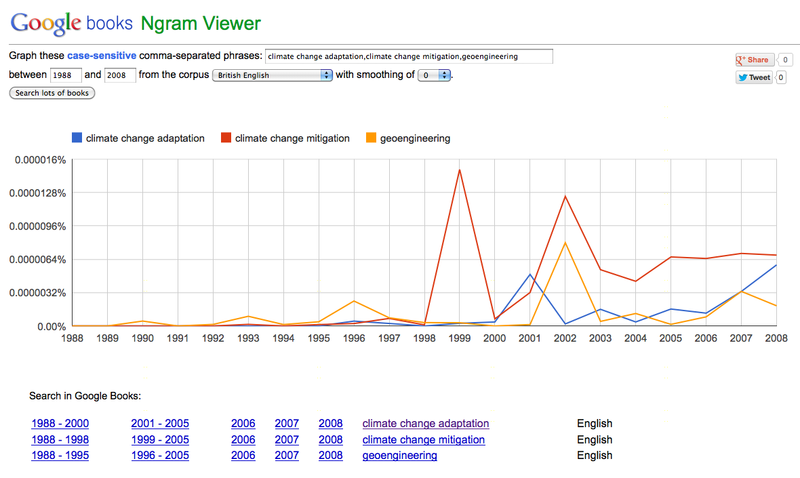 When I searched English language publications, I found that the volume of hits for climate change mitigation was higher than for climate change adaptation*, which was more what I had expected, but there were peaks in unexpected places. I expected a peak in 2006 and 2007, that is in the years when climate change coverage peaked according to many researchers, such as Max Boykoff (followed by another peak prompted by the climategate affair). Things became more interesting when I chose American English and British English to carry out the searches. As shown in an article by Nerlich, Forsyth and Clarke, the UK and the US really are two nations divided by a common language, especially when it comes to discussing climate change. 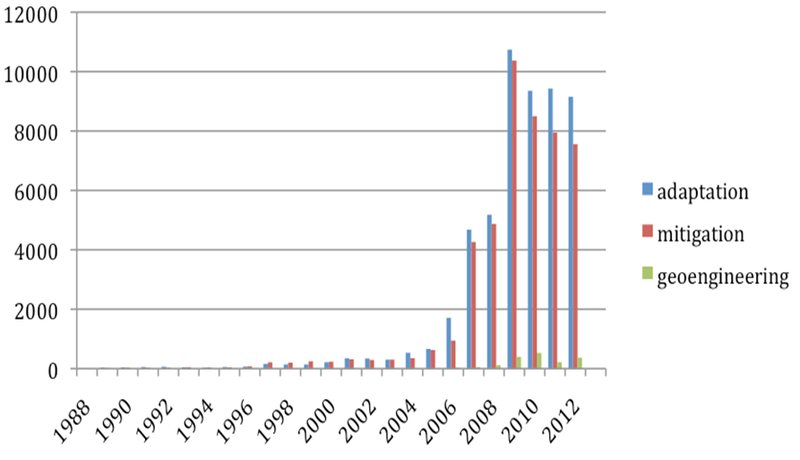 British English discourse about climate change mitigation peaked after the 1997 Kyoto protocol, with another peak around 2002; and climate change adaptation has been trying to catch up with mitigation since 2007. 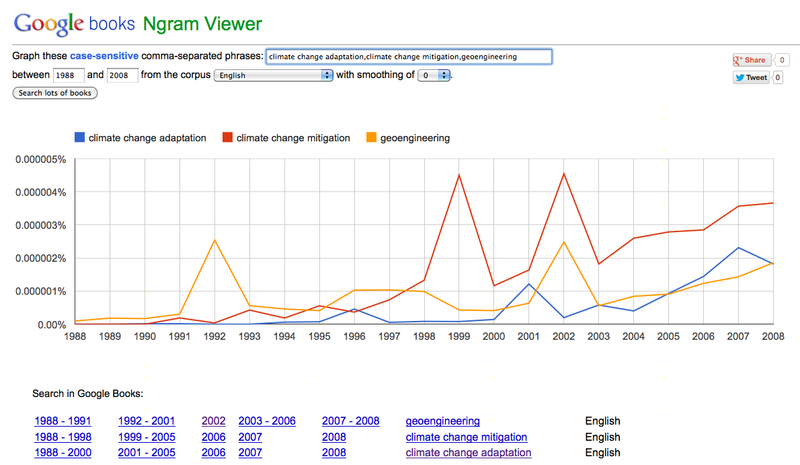 By contrast, American English interest in geoengineering peaked in 1992 but trends around climate change adaptation, climate change mitigation and geoengineering have been rather flat ever since. We (that is, one of my PhD students, Ruijing Li and I) then examined news coverage using Lexis Nexis. We searched this news database with the search terms adaption/mitigation/geoengineering and climate change or global warming** (on a high similarity setting) and focusing on English Language News. We expected to see some fluctuations, but what we found was just a steady and then almost exponential rise after 2006 of the use of adaptation and mitigation (in the context of climate change or global warming), with geoengineering not really getting a look in. Surprisingly, there was more discussion of adaption rather than mitigation from the very start of the climate change debate in 1988 (Jaspal and Nerlich, 2012). This still leaves some other mysteries to be solved! *I could not search for ‘adaptation’ etc. 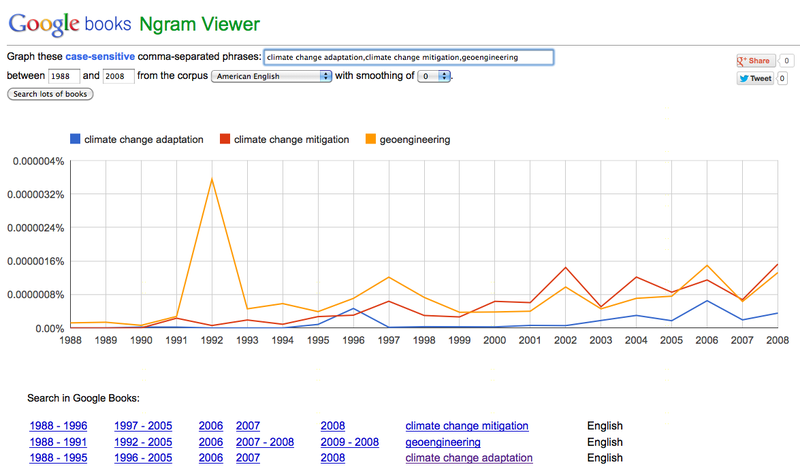 alone (too many hits), so had to search for climate change adaptation (so numbers became quite low). Geoengineering is better in that respect! *On Lexis Nexis you can use a combination of search terms to probe a certain topic. Added 5 July, afternoon, after interesting suggestions on twitter by @WarrenPearce @cwhope @LeoHickman @BarryJWoods @JimDensham – it might be worth looking at alternative words, such as abatement, prevention, coping… quick check on Google Trends and ngram viewer show low numbers, but made me think that my search strategy might have been hampered by the fact that I can’t just search for mitigation, but had to search for climate change mitigation, see * above – unless somebody has another idea. It’s not clear what your sampling frame is but the annual COP climate negotiations take place in Nov each year – Oct may reflect the run-up to that. Might be interesting to sample November as well. There was massive interest before the COP in Copenhagen in 2009. You are right, Will check asap! 1. I suggested that the peak in interest in October may be due to the fact that most people live in the Northern hemisphere (where minimum sea ice extent in the Arctic in September) – although Ruth Dixon’s suggestion seems more plausible. 2. It is a great shame that people have seemingly spent more time talking about adaptation (than about mitigation) because (a) mitigation becomes harder the longer we fail to seriously attempt it; and (b) there are some things to which life on Earth cannot adapt (such as species extinction due to over-fishing and/or ocean acidification). The initial graph we used was slightly misleading. We have sorted that out now and inserted a hopefully better graph which seems to indicate that the fluctuations are indeed related to COP meetings. I am still slightly puzzled by the fact that talking about mitigation and adaptation seems to go in tandem in the media (but there might be something we are not seeing or doing wrong), rather than mitigation being the dominant discourse, which I had expected. As one says, further research is needed!